The rapid expansion of budget hotels and visitors' rising expectations are threatening the future of the traditional guest house. Fusty bed and breakfasts with their loud carpets and louder landlords have remained stubbornly unchanged for decades. And now they could be facing face their final chintzy curtain. The expansion of budget hotel chains and the emergence of travellers with high standards but tight budgets, are forcing the old-fashioned, low-grade guest house out of business. 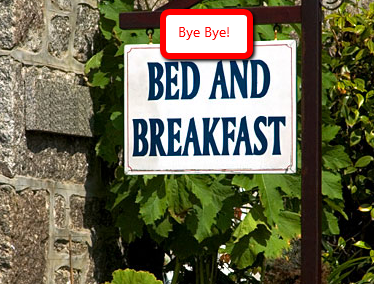 More than 1,500 B&Bs with fewer than three stars have closed in England since 2007, a cut of more than a third. In Scotland, one- and two-star B&Bs are down by 63 per cent, while the number of budget hotels is up 80 per cent. A third of guesthouses and B&Bs in the UK report having fewer guests in last month's school half-term than in 2010. It could all spell the end of shared bathrooms, early breakfasts and nylon sheets.